The Death Angels demonstrated a lot of hard luck for a couple of weeks after the big change in personnel created by end of tour rotation for most pilots and maintenance personnel around December 66 and January 67. All of our Multiple Bomb Racks had the electric wiring cut off at the cannon plug which rendered them useless until the time consuming task of rewiring was completed. My job initially was assistant maintenance officer. Having held the job of Aircraft Maintenance Officer for two years in a Crusader squadron, the mysterious failures and damage to aircraft systems and ordnance components was mighty suspicious. When the Death Angels commenced delivering ordnance meant to kill the enemy and to closely support our troops engaged in combat the ordnance failures went from embarrassing incidents to dangerous and unsatisfactory accidents. We were dropping so many duds that we became known as the "VC re-supply squadron." Some of the problems included improperly connecting the arming wires on the MK-81/82 low/high drag SnakeEye munitions. I read the manuals and directives and held class on the Ordnance Officer and his NCOs and our squadron soon got proficient in loading and expertly delivering the banded and un-banded Snakes. Elaboration may be needed to explain operational use of the Snakeye air to ground bomb. The snakes were highly desirable for close air support. The bombs were excellent for dropping as banded/unretarded for road interdiction or against bunkers, trucks, armor and troops. When friendlies were in contact with the enemy the snakes could be dropped accurately at low level in the retarded mode. Selection of retarded or unretarded mode was done by the pilot in the cockpit prior to bomb release on target. The danger was if the pilot selected the retarded, unbanded mode and the fins did not open to the retarded position, the bomb would continue to glide beneath the aircraft until impacting the ground as a dud or until detonation below the aircraft. If the delivery was level, the plane could be blown out of the sky. If the delivery was at 10 degrees nose down, the bomb would not have time to arm and would impact as a dud to be picked up and used as a mine by the enemy. Snake and Nape was a favorite air to ground ordnance load for low altitude close air support of Marine Grunts. It seemed we would solve one ordnance or fire control problem and another glitch would appear. I became the Squadron Maintenance Officer on 15 February upon the transfer of Mike Witter. The Death Angels soon were expending huge numbers of MK-84 2000 lb GP bombs on Hill 881 just north of Khe Sahn in efforts to stop the NVA advances. The pilots usually rolled the wings vertical to watch the huge detonations of the 2000 pounders they had just dropped. Reports came back to me that many of the bombs were not exploding. I went to ordnance and checked the fuse times and wiring. The wires were going with the bomb. That meant the arming hooks that held the wires were releasing and thereby not arming the big bomb. The wing pylons were checked and we found that the wire could be yanked from the arming hooks even with the solenoid armed. I removed from the pylons the arming hook apparatus which was shaped like an inverted U. The hooks were to close tight when armed to hold the wire so it would stay with the pylon when the bomb was ejected and the propeller on the fuse would spin and arm the bomb. The area on the part just above the hooks had been tampered with by a screwdriver type tool. A thin one quarter inch detent had been pounded into the arming hooks device near the top which spread the hooks just enough that the wire would pull out of the hook points upon bomb release. I contacted the NIS [Naval Investigative Service] and they verified my findings. There was insufficient evidence to prosecute anyone although the fault was within the purview of fire control avionics. The prime suspect was transferred to the Air Group Maintenance Department and the 2000 lb duds ceased. Early one morning in June "Animal" Norm Marshall came to me with a problem. Norm said, "I had a midnight TPQ to the DMZ last night. While pre-flighting with my flashlight, I noticed all four of the 500 lb bombs on each MBR [Multiple Bomb Rack] had words painted on them. I didn't think much of it since the troops do it for Easter, Christmas and sometimes just for the hell of it. But, this time the words were 'Soul Brother' which was a new twist. During the radar bomb run I pickled the eight bombs on 'Mark, Mark' and broke hard right back to south of the DMZ. While at 90 degrees of bank I watched for the bombs to detonate. Mofak, the bombs did not explode!" Two plus two added up easily on this new 'Dud' problem. I called in the Avionics and Ordnance chiefs. During questioning I was told that the suspect from the previous rash of bomb duds had been reassigned back to our squadron. We had recently been given a new Commanding Officer and a new Sergeant Major. The sabotage suspect asked to get back with the Death Angels on the night shift and his wish was granted without the leadership checking with Squadron Maintenance. The CO listened to my evidence but refused to charge the suspect. The best action I could get from the new CO was the suspect would go back to Group Maintenance. I worried for the safety of other squadrons who would be receiving parts and repairs from the Group support squadron where an identified active saboteur existed. Colonel Lonnie [Red] Bates who had flown with me in F8 squadrons at Beaufort when I was in VMF(AW) 451 arrived in DaNang at the Air Wing headquarters. Red came down to fly with the Death Angels on June 4, 1967. I had flown two missions in DB-3, BuNo 149194 that morning and the aircraft worked fine. Red launched in DB-3 and proceeded north toward the DMZ at fifteen thousand feet. Just northwest of Phu Bai, the crusader flamed out. Red said it was as though his throttle was disconnected. Moving the go handle provided no response to falling engine RPM. DB-3 carried a full bomb load and rapidly reached ten thousand feet where Red ejected. Colonel Red Bates was safely recovered within minutes of reaching the ground. DB-3 crashed into a Vietnamese cemetery west of Phu Bai Air Base. "Red" Bates was medivacked to a hospital in the United States for treatment of injuries sustained during the ejection. The CO wanted some answers on how and why DB-3 flamed out. I was ordered to send qualified personnel to the crash site and investigate the probable cause of the flame out. Although I had doubts that much was left of the aircraft in view of the load of bombs and the explosion at impact with the ground, I told GySgt A.J. Jobbagy, NCOIC of line personnel and a senior engine mechanic, to grab a toolbox, his .45 pistol and a canteen to accompany me on a trip north. Neither a grease gun nor an M-16 was available for me to check out so I was stuck with my .38 caliber bullet launcher for defense. It was the morning of 5 June that we jumped aboard a CH-46 and headed north across Da Nang Bay then up Hai Van Pass to Phu Bai. The SeaKnight trip was a welcome cool ride in the well ventilated cabin of the helo. Thirty minutes after departing MAG-11, we arrived at Phu Bai. The CH-46 circled the dusty looking tent town and finally landed on a paved area near a makeshift control tower. Phu Bai air base appeared deserted. No burning drums, no troops visible, and no moving vehicles. We relaxed on some pallets and waited. After about an hour a HU1E Gunship arrived at Phu Bai to pick us up followed by two CH-46 helos full of troops to cover our insertion into the cemetery. Soon it was discovered that the cemetery was full of Gooners. Like churches, cemeteries were no-fire zones. 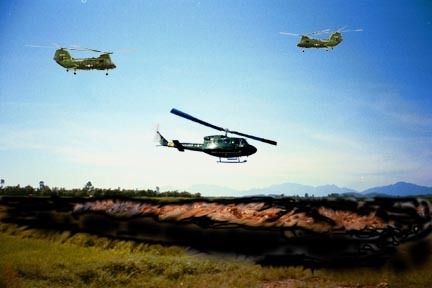 As the CH-46's circled overhead the cemetery, ground fire was observed coming from the vicinity around the black hole marking the crusader impact point. Realizing that recoverable engine parts were virtually out of the question in view of the size of the crater and knowing we would be putting troops in harms way if we continued our insert, I scrubbed the mission. We notified the FSCC and recommended that the cemetery be hit by air, Naval gunfire or artillery since the enemy was using it as a safe haven. I also figured that any requested attack on the cemetery would be disapproved. Flying around near a hot landing zone in a helicopter was not my kind of warfare. I could hear the Grunts in the two CH-46's hollering in the radio background about not going in and shooting up the place. Those tough guys were actually disappointed that the skirmish was cancelled. I was used to passing the hot spots at 500 knots giving the NVA little chance of hitting my aircraft. The Marine Grunt is something to be proud of. We were happy to catch another CH-46 back to Da Nang. Jake and I were dropped off at Da Nang Air Base in time for the noon meal. I arrived at the squadron hangar in time to fly an afternoon bombing mission in crusader BuNo 150883. As I flew over Quang Tri, the thought of those Grunts complaining about scrubbing a gun battle with the NVA gave me cause to chuckle. Operations were normal for about two weeks and then Charlie Cronkite brought engine tampering back into question after he was killed on June 20, 1967. Charlie took off to the north from Da Nang Air Base and flamed out near Phu Bai. He turned the dead crusader for Da Nang while trying to relight the engine. The engine did not respond to emergency procedures. When over Da Nang Bay a couple of miles north of the air base boundary Charlie ejected. Charlie was observed to land in the bay but was deceased when the Rescue helo picked him up. The crusader was in about twenty feet of water and still intact so salvage operations began immediately. The aircraft was brought to the Air Group maintenance and the engine removed for the investigation. An engine tool was found inside the fuel control. The investigators determined the stray tool had caused the engine failure and the subsequent death of Charlie. War is hell. Acts of Sabotage and treason add aggravating complications to the deadly scenario.